Well it had to come sooner or later, the 110 has over 200k miles on the clock and the engine was getting tired. Depending on how they’ve been looked after, they reckon a Rover V8 will be getting tired by 50k to 100k miles - so this one wasn’t doing too badly. I scrapped a Discovery last year, specifically for the engine and axles, so the engine out of that was overhauled ready to pop in the 110. Now simply swapping the engine on a ‘like for like’ basis is fairly simple, possible in just a day, but swapping in an efi engine where once were carbs is a different matter. For the benefit of anyone else considering such a change, here is what I’ve found out. Firstly, I’m told that all the V8 blocks are identical externally - even down to still having imperial threads in the latest 4.6 models. So you can take a 4.6 block and bolts on the font cover and ancillaries from a 3.5 and it will all fit (you need a spacer between crank pulley and retaining bolt as the crank has a longer nose on the 4.6) - something I have in mind when funds permit (there’s a 4.6 sat in the garage waiting !) 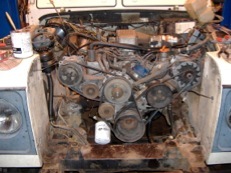 If you are replacing a diesel then there’s more changes as I believe the engine mountings on the chassis need changing (but that’s not something I’ve done ... yet - I have a diesel 90, and a spare V8, hmm), and of course you’ll need a suitable gearbox or adapter. In this case it was already V8 so that is taken care of. 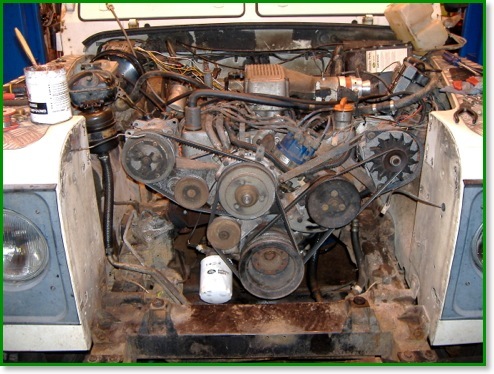 Physically swapping the engine is the easy bit - just disconnect everything, unbolt, remove old engine, drop in new engine, bolt in place. Now, the easy way to do things would be to use the ancillaries and engine loom off the old engine - but I’ll probably want those when the old engine goes in the 90. In addition, I have plans for the air-con pump to supply compressed air. So, I kept all the ancillaries as they were in the Disco - which makes it quite a wide setup as the photo shows. Unexpected problem number 1, I had the reducer for the LPG system bolted to the nearside panel just behind the radiator - roughly where the alternator is ! The next problem I had anticipated, again the simple way would have been to keep the exhaust manifolds off the old engine and leave the whole system as it was. But again I anticipate wanting to use these in the 90, and the Disco has the much better twin pipe manifolds and downpipes. 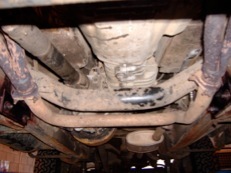 With these, the pipes go underneath the gearbox crossmember - lucky I kept the crossmember from the Disco. Unfortunately, the joint between the Y-piece and the centre box is different so I had to cut the end off the old Y-piece and weld it onto the Y-piece from the Disco. So the Y-piece is non-standard, but the rest of the system is standard 110 (center & rear box) or Disco (manifolds and downpipes) parts. Electrics ! I’m OK with electrics, but I know it baffles most people - if you are in the latter camp then you probably won’t want to tackle this ! 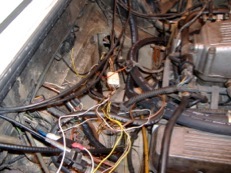 There are two lots of electrics to deal with - the engine loom and the efi loom. I used the Disco engine loom, so it’s mostly a matter of cutting off the round plug, removing the wires not needed (brake fluid level switch) from the loom, then soldering on some bullet connectors. You’ll also need an extra cable with a ring terminal one end (battery connection on starter) and two bullets on the other end to feed the main harness - this is part of the engine harness on the 90/110 harness, but not on a Disco where the feeds all come off a stud in the bulkhead. Also, on the Disco the feed for the coil is via the loom on the nearside wing, so I used the wire originally intended for the tacho (‘W’ terminal on the alternator) instead. Having connected everything up you should then have a vehicle with electrics, oil and alternator warning lights, starter - but no fuel. I’l add that I haven’t done all the electrics yet - just enough to be able to drive it home. Now for the efi system - something that fills most people with dread and shouts of “it’s too complicated” ! 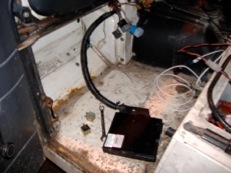 I’m fitting the ECU and relays in the passenger footwell - above the piece of cardboard that’s normally there. Before putting the new engine in, I used a holesaw to cut a hole and feed in the efi harness. It’s not all the way through in these pictures as it needs further modification - the wires to the idle stepper motor need extending as the loom was originally intended to go through on the drivers side. At the moment they are simply sat on the floor as shown. While I was rebuilding the engine, I took the opportunity to modify the efi harness for the LPG conversion - adding a relay and extra connector. On these injection systems you can cut the petrol by removing the supply to the injectors themselves and avoid the cost and wiring complexity of eight cylinders worth of emulators - this is fairly easy to do with just one relay to interrupt the brown/yellow wires going up the harness to the injectors, but note that one of these also feeds the supply to the air flow meter so part of the harness needs untaping to bring a separate wire down to the live side of the relay. In this picture you can see (slightly above centre in the pic) the road speed transducer in the speedo cable I kept from the Disco - this is used by the efi ECU. This bolts on the nearside chassis rail using one of the gearbox mounting bolts. In the lower right of the picture is the lambda probe for the LPG system. This was the second unexpected problem I came up against - the Disco speedo cable doesn’t fit the 110 speedo. For the moment i’ve simply put the original speedo cable back in - the ECU works without it, but it does get upset and bring on the MIL (Malfunction Indicator Light). 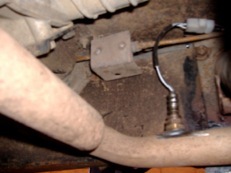 Land Rover did do a V8i Defender, so it’s possible that there is a suitable cable available - but sods law says that either the road speed transducer or speedo head have different connectors so it won’t fit (I haven’t got hold of a parts book covering the V8i Defender yet). In the next part, I’ll show where I moved the LPG reducer to, what I did with the washer bottle, and how I mounted the air flow meter and filter.